In the later pre-Dynastic period in Egypt, the most important culture during the four centuries before the country became united under a single king was the second stage of the civilisation which originated at Naqada in Upper Egypt. This is known by the name Naqada II (3600-3200 BC), or alternatively as the Gerzean period, and it was a period of rapidly accelerating development. Before that, during the earlier Badarian period and by the beginning of Naqada I, at around 4000 BC, settled agriculture had become the way of life for Egypt as a whole, exploiting rich but geographically restricted natural resources probably due to changing economic conditions, competition, and social impetus. 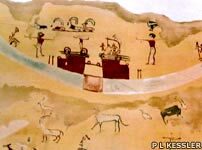 The ancient indigenous methods of survival - hunting, fishing, and making use of wild plants - all served to support the subsistence economy of Egypt until the 'Late Pre-Dynastic Period'. However, the population was increasing and this affected the distribution of plants and animals in the desert. Elephants, giraffes, and ostriches seem to have vanished from the nearby desert and Nile floodplain during this period (climatic changes would have a devastating effect on the Sahara region just two thousand years later - see related link in the sidebar). The pre-Dynastic communities in the Nile Valley were becoming increasingly urbanised while this was going on. The north and south developed independently, with the south (Upper Egypt) displaying very distinctive cultural elements such as new artistic activities, plus highly specialised craftsmanship and religious beliefs and practises. By 3600 BC those artistic activities had resulted in the appearance of two entirely new products which distinguished the Naqada II culture: a distinctive pear-shaped mace head, and a style of pottery painted with lively images of people, animals, boats, and plants. During the same period, and by 3000 BC, all the habitable areas in Egypt were occupied, including the Nile Delta (Lower Egypt), the Faiyum, the Western Desert Oases, and the Nile Valley. 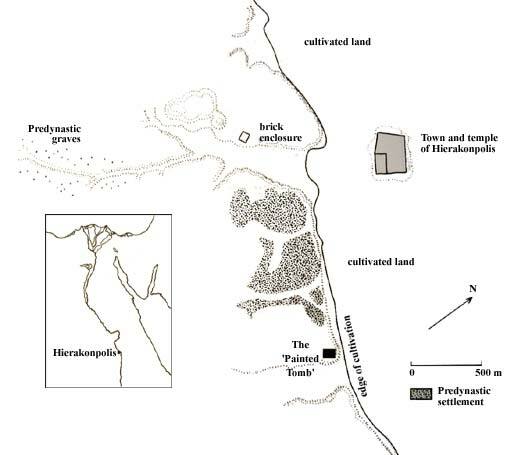 Clusters of regular mud-brick dwellings were constructed at the old centre of Naqada and also at Hierakonpolis, a town which became the residence of the pre-Dynastic rulers of Upper Egypt. One of their tombs at the latter site, the 'Painted Tomb', was found to be very richly decorated. Naqada had been at the height of its success during the Naqada I period, judging by graves and grave goods, but was subsequently overtaken by Hierakonpolis, which was probably the dominant of the three proto-cities in Naqada II. Elephants, giraffes and ostriches seem to have vanished from the nearby desert Nile floodplain during this period. It seems these were 'the centres of powerful territories, each ruled by a hereditary elite exercising authority on a regional basis'. The heads of these states are generally accepted as being early kings of Upper Egypt, and some writers have gone as far as referring to Naqada II as 'Dynasty 00' to reflect this (Naqada III is often referred to as Dynasty 0). There is evidence of increased political activity and the general opinion is that a struggle for predominance now developed between Upper and Lower Egypt. 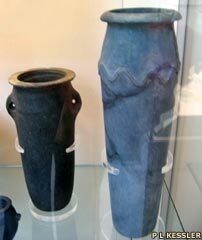 In the latter location, local products in the Delta were replaced by objects typical of the Naqada II culture by about 3250 BC, completely replacing any Lower Egyptian elements. The same thing would eventually happen to their ruling houses. At the same time, bigger and more practical river ships were being constructed, and trade along the Nile was flourishing. Egyptian boatbuilding changed from construction with reed bundles to wooden-planked vessels. The wood was being imported from the Near East as part of an intense exchange of trade. Imports of lapis lazuli show that such trading went as far as Badakhshan in modern Afghanistan. Lapis lazulis was traded across land and by sea via the Persian Gulf to Sumer. Writing was not brought into Egypt from Sumer, but developed independently and may have began during this period with representations being included on Naqada pottery. This pottery apparently charts the gradual stylisation of the plants, animals, and religious dances depicted, eventually resulting in a set of divine symbols that are virtually hieroglyphic signs. Within a very short time of Naqada II, the country was united, and Egypt was well on the way to developing its first true culture, comparable with that of Sumer and far longer-lasting. Williams, Early Dynastic Egypt, 1999, 2001. Images copyright © British Museum. Text copyright © P L Kessler based on data from the British Museum, Predynastic Faiyum, and other notes. An original feature for the History Files.